Thomas L. Elder store card struck with a portrait die by Daniel Carr (engraved in 2019) paired with a vintage Elder die from the Delorey-71 (reverse). 28mm, struck on a copper US large cent circa 1816-1856. Coin-flip orientation. 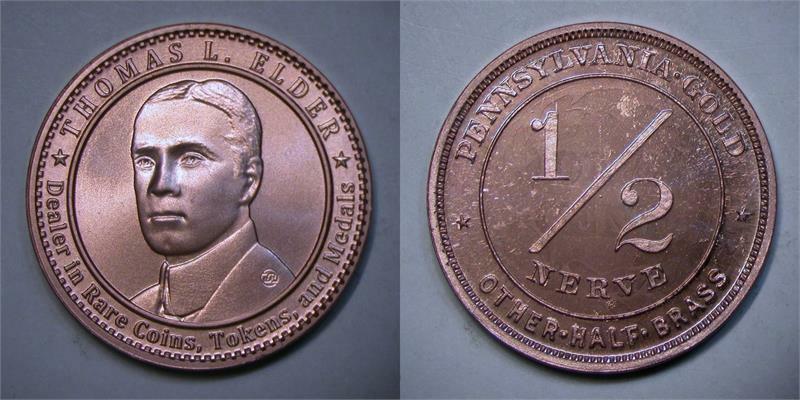 Most will show some evidence of the underlying large cent design, such as the ear of the Liberty Head on Elder's cheek.